We follow up our comprehensive round-up of mastering limiter plug-ins for Pro Tools with a look at hot new products from three further manufacturers. Since we published our shootout of mastering limiters for Pro Tools in the May 2006 issue, PT users have seen two new mastering limiter plug-ins released from TC Electronic and Massey Labs. We've also had several letters pointing out that the original roundup didn't include Wave Arts' popular Final Plug or Multi Dynamics, so in this month's Pro Tools workshop, we're going to run a 'take two' shootout comparing all these limiters. In the interests of fair play all round, I'll be using the same comparison procedure and the same test source material; for more details see May 2006 issue. TC's MD3 Stereo Mastering package includes single-band and multi-band limiters, while Wave Arts' Final Plug and Massey Labs' L2007 are single-band designs, so there are three new entrants in this category. 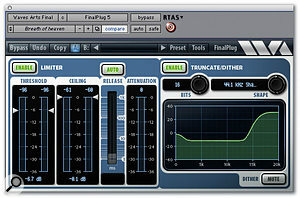 Final Plug is a look-ahead peak limiter with bit-depth management and noise-shaping dithering. It looks and feels very simple to the Waves L1/L2/L3 range except that it has a graph section added into the window. This shows a very comprehensive dither and noise-shaping section with a good selection of noise-shaping curves to suit the different sample rates and bit depths. It has a feature where you can turn off the dither noise with a Mute button, allowing you to compare the undithered sound with the dithered output. Final Plug also includes a range of presets ready for CD and DVD Audio mastering. 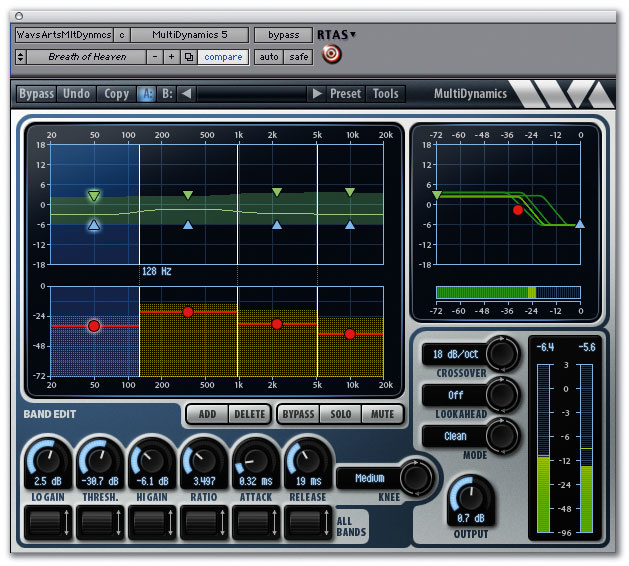 Unlike the other products on test here, Wave Arts' plug-ins are not available in TDM format, but they are the only ones of the three that include Audiosuite off-line versions. TC's Brickwall Limiter and MD3 were originally options for the System 6000 hardware processor, and software versions have been around for quite a while as part of the Powercore mastering suite, but TC have only just got around to releasing Pro Tools versions of them. 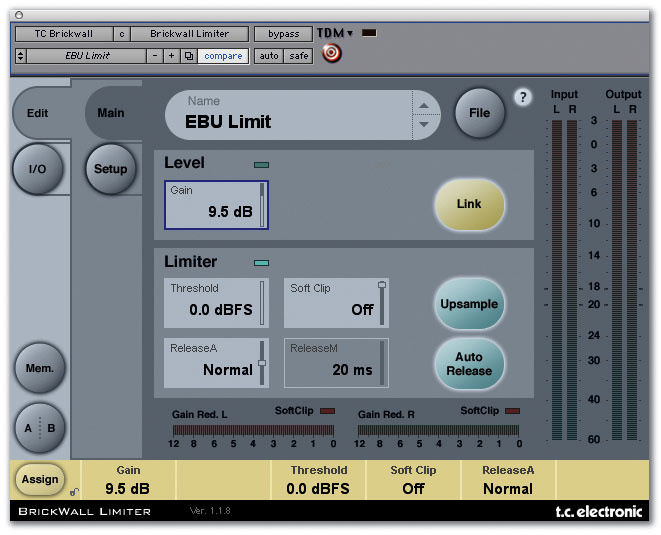 Brickwall Limiter operates at 48-bit and uses a five-times oversampling algorithm for accuracy. The meters always upsample to make sure inter-sample peaks are detected and measured — the meter scale goes beyond 0dBFS to +3dBFS so you know you are going right over. TC Electronic boast that Brickwall Limiter is bit-transparent below its threshold, and there is a green light next to the Threshold control which lights to show when it is operating in bit-transparent mode. However, Brickwall Limiter only has basic bit-depth management and dither, with no noise-shaping options available. This new limiter comes from Stephen Massey, who used to work for Trillium Lane Labs and has now set himself up producing very cost-effective plug-ins that are creating a lot of interest. Stephen's L2007 mastering limiter looks excellent value — you get both TDM and RTAS versions for $89 — and is again similar in look to the Waves L-series, except that he has chosen to go for knobs to adjust the threshold and output level. In addition there are two rotary switches, the first of which is called Mode and alters the behaviour of the envelope detector, packaging a complex range of adjustments into a simple four-position control. The Release rotary switch is obvious in its function and settings. 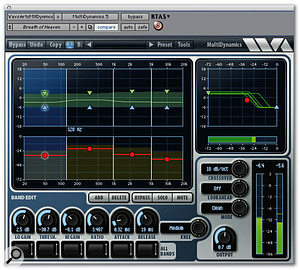 In the multi-band category we have TC Electronic's MD3 and the Wave Arts Multi Dynamics plug-in. The MD3 plug-in is much more than a multi-band limiter: it has an EQ section with four-band parametric EQ, a normaliser section, a three-band dynamics section with compressor, limiter and expander options, an M&S encode and decode option and a brickwall limiter on the end. Other interesting features include automatic gain make-up and a lookahead delay to help with peak handling. All of this makes MD3 a very comprehensive mastering tool in one package. The main window has six pages, which relate to MD3 's various sections. It starts with the main page, where you set input levels, M&S encoder and decoder options, and the crossover points between the three dynamic bands. Next we have a page for the four-band EQ section, followed by a Normalise page to help adjust the levels going into the dynamics section. This takes up the next two pages, one for an expander page and the next for a compressor. Finally, the output page includes the brickwall limiter. The Multi Dynamics plug-in offers up to six bands of dynamics with both compression and expansion, and has a comprehensive graphical interface to display everything that is going on in just one plug-in window. 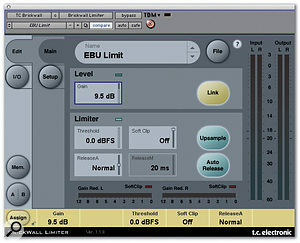 Unlike conventional dynamics processors that work around threshold, ratio and gain make-up controls, Multi Dynamics still has threshold and ratio controls but the gain make-up is replaced by two separate controls. Simply put, the Lo Gain control determines the amount of gain applied to the signal when it is below the threshold, and the Hi Gain control determines the amount of gain applied above the threshold. The steepness of the transition from Lo Gain to Hi Gain, as the signal passes through the threshold, is set by the ratio control. So unlike a conventional compressor that continues to apply more gain the further past the threshold the signal goes, Multi Dynamics limits the maximum amount of gain with the Hi Gain control. Similarly, a conventional expander continues to apply more attenuation the lower the signal goes below the threshold, but in Multi Dynamics the maximum attenuation is set by the Lo Gain control. To configure Multi Dynamics as a compressor, therefore, you set the Lo Gain higher than the Hi Gain, while if it is an expander you need, you set the Lo Gain below the Hi Gain. *Note that Ozone 's Multi-band Dynamics module is not primarily intended for loudness maximisation. Just to recap from May's article, my tests used five clips covering a wide range of different programme material: a drum & bass track, a rock opera with solo vocal and choir, a jazz quartet piece, a solo vocal ballad and a classical orchestra piece. First I measured the loudness (Leq A-weighted) of the unmastered version of each track to get a reference. Then I used each limiter to increase the loudness as far as I could without experiencing unacceptable side-effects. Finally, I measured the loudness of the processed version and came up with a loudness improvement score for each track processed by each limiter. The loudness increase is a definite measurement, and although I acknowledge that the point where unacceptable side-effects start is subjective, the fact I did all the tests during the same session, then reviewed the results and redid any that I wasn't happy with, should give as fair a test as I could achieve. See the test results table for more information. On this take 2 shootout I used the best two in each category to get a sensible benchmark to compare sound quality. The three new limiters were all quite similar to each other, but L2007 edges it for me, maintaining some space whilst producing very high gain improvements. Again, all three were very similar in sound, although Final Plug appeared to produce some strange intermodulation-type effects which only became obvious while I was doing the final comparisons between each version of this track. However, they all managed to retain the vocal cut I commented on in the original article. The problem with the piano under the vibes distorting showed up again with all three contenders. Final Plug suffered the most with TC's Brickwall Limiter performing the best. All three handled this remarkably well. Brickwall Limiter produced a less smooth, rounded sound and yet again L2007 handled itself very well, especially with the Mode switch on Mellow. This track proved just as hard for the three new contenders as for the products in the first round-up. I had to reduce the amount of limiting significantly on Final Plug to lose the problem of hearing it work too hard. Brickwall Limiter did remarkably well, but the star of the show here is L2007. With the Mode switch on Smooth, it produced an excellent sound with a very good loudness improvement. The interface is very intuitive, and I like the way the meters work too. You can see exactly what is going on and the sound from it is good too. It is a shame that the noise-shaping profile name is truncated; you need to click on it to get the pull-down menu list to see the name of the profile you are using. The manual gives a very useful guide as to what each profile does, comparing where relevant to equivalent Waves L1 and L2 profiles. This is the only plug-in of the three which has an Audiosuite version, but I did come across a bug in regard to this: when copying the settings from the RTAS version to the Audiosuite one, the Dither profiles didn't copy across. All the other settings came across fine, but the Dither profiles didn't get transferred, whether I copied and pasted the settings or Saved them in one and opened them in the other. Perhaps because it's the only one that doesn't look like a Waves plug-in, I found Brickwall Limiter 's interface somewhat confusing! I would have been less confused if the Threshold control had been called Output and the Gain control Threshold, and it took me a little while to work out what they did in practice. The bit-depth management and dither are hidden away on another page in the plug-in window, and there are no noise-shaping options, which surprises me for a plug-in in this price bracket. This plug-in has got to be the star of the show; when you consider its price, it is truly amazing. The Mode switch is simple and effective, though I would have preferred to have been able to go back one position instead of having to keep clicking to get it back round again. I also took a little while to find the best way of moving the mouse to get the rotary controls to respond accurately — as I have said before, I struggle with rotary controls when using a mouse. That said, let's hope that Stephen Massey continues producing plug-ins of this quality at an unbeatable price and that he doesn't get swallowed up by above manufacturer who then immediately puts the prices up! Pro Tools HD systems process all audio internally at 24-bit, and Pro Tools LE processes audio at 32-bit floating. Assuming we are mastering to CD, we need to have the end result as a 16-bit file, but simply truncating 24-bit audio to 16 bits produces what is called quantisation noise. On its own, this doesn't sound too pleasant, albeit at low level. The solution to this problem might seem strange: we add small and controlled amounts of noise, in a process called dithering. Amazingly, adding a small amount of noise actually increases the low-level detail in a digital audio signal. When adding dither into your final mix, you need to make sure you only do it once, and it has to be the last stage in the mastering process. Consequently, you need to know whether your host application is already adding dither, and if not, you need to add a plug-in in the final stage to do it for you. Remember that the inserts in the Pro Tools master fader channel are after the master fader itself so that last insert is the last point in the mixer. The standard Pro Tools mixers do not add dither, so you must use a plug-in to do this for you, although Digidesign do have versions of their HD mixers with dither built in — one for stereo and one for surround — and you can swap to these if you wish. The term 'noise shaping' refers to the fact that dither algorithms can be designed to concentrate the noise energy in areas where the ear is less sensitive, thus making it less perceptible, although it will still work its magic by allowing the low level detail to come through. For example, if your final output file is at 96kHz, you can use a dither shape which concentrates the noise above 20kHz where we can't hear it. As you will see from the results tables, there is no contests when it comes to multi-band limiters: TC Electronic's MD3 walked away with it every time. At first I didn't get on with the multi-page format of this plug-in, but very soon I found I was very easily switching between the different pages to make the various adjustments, though I do still feel they could more attempts to make this plug-in's interface more graphical in style. TC Electronic MD3.Once you start to work with MD3 you find that it is perfectly designed for mastering. I especially liked the M&S feature, and was able to use it to improve the stereo presentation of all of the test tracks. I also really appreciated the summary section of the window across the bottom, which changes to show settings for the features you select, with individual bands and global controls all available at your fingertips. One of the other carefully thought-out features is the provision of indicators for soft clipping from the Normaliser section displayed in the Compressor section, so you are immediately aware that the preceding section is clipping without having to even select it to check. In general I found it very easy to get a good sound with this plug-in. TC Electronic have got the balance of the number of controls available to tweak just right and the pedigree from the System 6000 comes shining through in this plug-in. Once you appreciate what this plug-in is designed to do and the function of the Lo and Hi Gain controls, its interface makes much more sense. Wave Arts have managed to get a lot of information into the one window, and designed an intuitive graphical interface. I like the 'roller' controls that control a parameter across all bands, and the way the cursor changes to an up/down indicator when you adjust a control to show you which way to move the mouse. It is features like this that, for me, make such a big difference in the ease of use of any plug-in or application. Wave Arts Multi Dynamics.In the first shootout, we had the Izotope Ozone multi-dynamics section, which turned out to be much more of a dynamic EQ plug-in rather than a limiter per se, and the same should be said for Wave Arts Multi Dynamics plug-in. 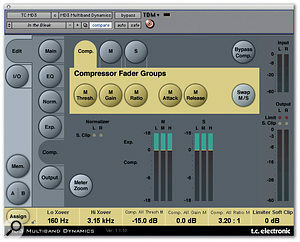 It is very clear in the manual that it is designed to perform as a dynamic EQ processor. This doesn't rule it out it as a mastering tool — far from it, it is very useful at handling all sorts of problems that neither EQ nor dynamics plug-ins will handle by themselves. As MD3 has a limiter in its final stage, it seemed a fairer comparison to put Wave Arts Final Plug after Multi Dynamics and set them up together, so Multi Dynamics ' scores in the multi-band section are for both plug-ins together. Even with the two plug-ins in tandem, though, I still found it tricky to get a really good sound in the time available. The low-level content came across as gritty, which is why it got marked down on sound quality. It may well be possible with more time and experience with this plug-in to get a better result, but at the end of the day I didn't get on with it particularly well as a mastering tool. In the single-band section the overall winner has to be the Massey L2007 mastering limiter. It performed very well on both loudness improvement and sound quality, and at the price, it is just amazing. In the multi-band section, TC's MD3 is top of the list, not just among these three products but of all the multi-band limiters I've tried. The sound quality was always just that bit smoother and rounder than the competition. 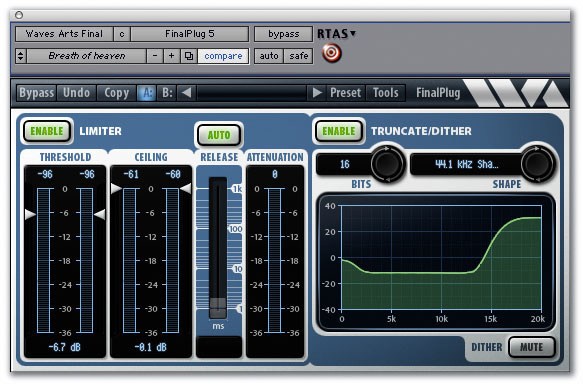 It isn't the cheapest plug-in, but if you are serious about mastering it is well worth the money. Final Plug and Multi Dynamics $199.95 each. Wave Arts +1 781 646 3794. MD3 Stereo Mastering (includes MD3 and Brickwall Limiter) £1116.25 including VAT. TC Electronic +44 (0)800 917 6510.